We've included these beaches for you: King Island and Shorncliffe Beach. When in Brisbane, make a side trip to see Bacchus Brewing Co. in Capalaba, approximately 44 minutes away. There's lots more to do: get your game on at South Bank Parklands, admire the natural beauty at Brisbane Botanic Gardens Mt. Coot-tha, find something for the whole family at Wheel of Brisbane, and get great views at Mount Coot-tha Lookout. 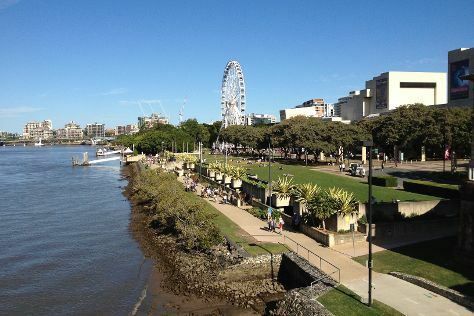 To see reviews, ratings, maps, and tourist information, you can read our Brisbane trip itinerary planning app . Cape Town, South Africa to Brisbane is an approximately 23.5-hour flight. You can also do a combination of bus and flight. You'll lose 8 hours traveling from Cape Town to Brisbane due to the time zone difference. Traveling from Cape Town in December, plan for somewhat warmer nights in Brisbane, with lows around 23°C. Finish up your sightseeing early on the 3rd (Fri) so you can travel to Loganholme. King Island, Bacchus Brewing Co.
On the 4th (Sat), brush up on your knowledge of spirits at Beenleigh Artisan Distillery, stroll through Alexander Clark Park, then relax and rejuvenate at some of the top local wellness centers, and finally do a tasting at Sirromet Wines. To find ratings, maps, and other tourist information, use the Loganholme trip itinerary planning app . Loganholme is very close to Brisbane. In January, plan for daily highs up to 35°C, and evening lows to 24°C. Wrap up your sightseeing on the 4th (Sat) early enough to travel to Macleay Island. On the 5th (Sun), browse the exhibits of Kara-Mia's Mosaics, then view the masterpieces at Macleay Island Art Complex, and then enjoy the sand and surf at Dalpura Beach. For traveler tips, photos, more things to do, and tourist information, read our Macleay Island online driving holiday planner . Getting from Loganholme to Macleay Island by car takes about 2 hours. In January in Macleay Island, expect temperatures between 35°C during the day and 24°C at night. Wrap up your sightseeing on the 5th (Sun) early enough to travel to North Stradbroke Island. On the 6th (Mon), take a leisurely stroll along Amity Point Jetty, enjoy the sand and surf at Amity Point Beach, and then kick back and relax at Frenchman's Beach. Here are some ideas for day two: explore the activities along Brown Lake, then have fun and explore at North Stradbroke Island Historical Museum, then take in the waterfront at North Gorge Walk, and finally enjoy the sand and surf at Cylinder Beach. Traveling by car from Macleay Island to North Stradbroke Island takes 4 hours. Expect a daytime high around 33°C in January, and nighttime lows around 24°C. Cap off your sightseeing on the 7th (Tue) early enough to travel to Bribie Island. Kick off your visit on the 8th (Wed): enjoy the sand and surf at Woorim Beach, examine the collection at Bribie Island Seaside Museum, and then stroll through Bongaree Beach. Get ready for a full day of sightseeing on the next day: browse the exhibits of Bribie Island Community Arts Centre, then kick back and relax at Red Beach, and then kick back and relax at Sylvan Beach. For reviews, ratings, other places to visit, and more tourist information, read Bribie Island trip itinerary builder tool . Traveling by car from North Stradbroke Island to Bribie Island takes 4.5 hours. In January, plan for daily highs up to 33°C, and evening lows to 24°C. Finish your sightseeing early on the 9th (Thu) to allow enough time to travel back home.